Diagnosing A Sinus Infection Can Be A DIY Project : Shots - Health News The nation's ear, nose and throat doctors want people to diagnose sinus infections themselves in an effort to reduce overuse of antibiotics. They're telling you how. 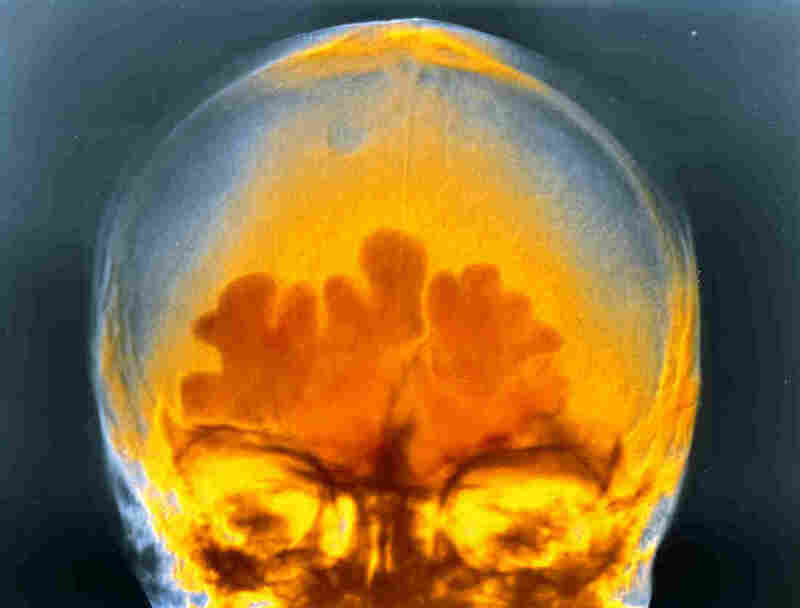 This is what the inflammation of sinus infection looks like in a false-color X-ray. It hurts even more in real life. Sinus infections are miserable, and it's hard not to want to run to the doctor for relief. Rethink that, the nation's ear, nose and throat doctors say. Most people who get sinusitis feel better in a week, the doctors say, and many of those infections are caused by viruses. Getting an antibiotic isn't going to help. So the ENTs want to get patients involved in figuring out what's causing the infection, partly to reduce needless use of antibiotics and also so that people who might benefit from medication will get it. "For the first time we've really made it crystal clear how to self-diagnose your own bacterial sinus infections without going to the doctor, with a high degree of accuracy," says Dr. Richard Rosenfeld, lead author of the practice guidelines published Wednesday by the American Academy of Otolaryngology-Head and Neck Surgery Foundation. OK, how can you tell if it's bacterial or viral? If you've been sick for less than 10 days and you're not getting worse, it's almost certainly viral. If you're not improving at all in 10 days or if you get worse in that 10 days after having improved a bit, bacteria are probably to blame. Underlying this DIY approach is the notion that it's OK to wait and see what happens, rather than hastening to get antibiotics. Even if it is bacterial, Rosenfeld says, antibiotics help just a tiny bit. "Most of what's going on is your body fighting off the infection yourself with maybe a little boost from antibiotics." Sinusitis gets diagnosed 30 million times a year, and with the infections accounting for 20 percent of all antibiotic prescriptions, the ENTs see this as a chance to reduce overprescribing. They're going further than their previous guidelines in saying that even if you're really sick, it's OK to wait on the meds. And they're breaking ranks with their fellow physicians in infectious disease and internal medicine, who say everyone with a bacterial infection should get an antibiotic. "We're not saying you're wrong to do it," Rosenfeld says. "We're saying, you know, there's a good chance you're going to get better on your own." So then what to do while you're feeling like your head is going to explode? Saline nose washes get a big thumbs up from the ENTs, as do as over-the-counter pain medications. The saline washes out mucus and reduces stuffiness, and also improves the health of membranes, Rosenfeld says. Steroid nose sprays may help with inflammation, the guidelines say, especially for people with chronic sinusitis, which lasts more than three months. Chronic sinusitis shouldn't be diagnosed just on symptoms, the guidelines say; a doctor needs to document there's inflammation of the nose and sinuses, something that can be done by looking up the nose with various scopes. "You can diagnose acute sinusitis from your armchair at home," Rosenfeld says. "But you can't diagnose chronic sinusitis." For that, at least, you need that doctor. While the vast majority of acute sinusitis is viral, the American Academy of Otolaryngology-Head and Neck Surgery Foundation notes that on occasion significant complications can occur from bacterial sinusitis. Signs and symptoms such as worsening headaches, visual problems, changes in mental activity, facial swelling and progressive fever can indicate impending complications. If those are observed, the patient should seek medical care.